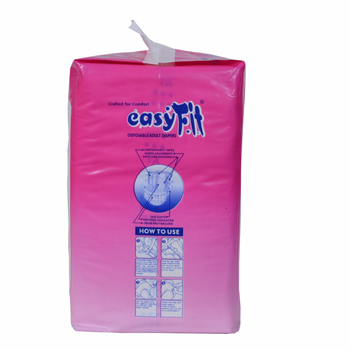 EasyFit Disposable Adult Diapers Xtra Large Size (10/Pack) are crafted to provide comfortable experience to the user. 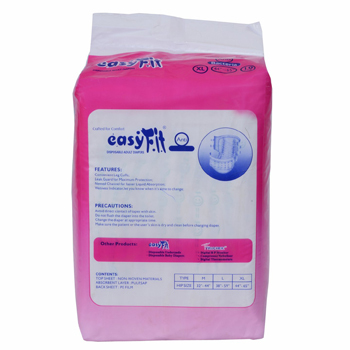 Suitable for Waist size 44-65 inches. 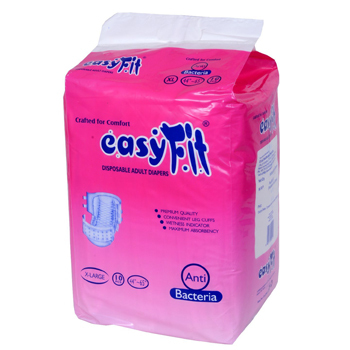 Usage: Patients with incontinence, Bedridden patients, Post operative care, Post pregnancy period, Unconscious patients, Patients with old age urinary problems, Accidental & burned patients. Precautions: Avoid direct contact of tapes with skin. Do not flush used Diapers into toilet. Make sure the patient or the user's skin is dry and clean before using the diaper. Dispose of the Diaper: Fold the used diaper properly and dispose off in the waste-bin. Do not flush.